For a second time this year a film has come out that surprised me. With the dreadful summer season behind us it was time to prepare for the onslaught of horror movies that always rear their ugly heads in September. Hollywood loves its trends, and the scary movie season around Halloween is one of the biggest. 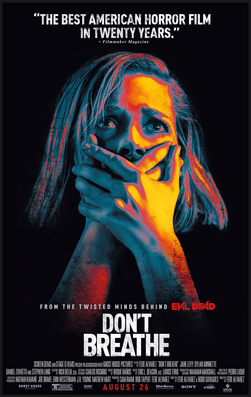 One of the first films out of the gate this year is, Don’t Breathe; a small scale film about a home invasion that goes horribly wrong. I went into this film after seeing the trailer, but I didn’t have any real expectations. Let’s get to it, shall we? Three young thieves, Rocky (Jane Levy), Alex (Dylan Minnette), and Money (Daniel Zovatto) discover a heist opportunity of a lifetime. An old, blind man (Stephen Lang) who lives in an empty suburb, has a massive fortune stashed away in his house. The trio decide to break into his house and steal the money so they can escape Detroit and start new lives in California. The only problem is this old blind guy isn’t as helpless as he first seems. Don’t Breathe is an interesting film. It’s a fairly simple premise, and it doesn’t waste too much time setting everything up. The plot gets pushed along at a decent pace, and before you know it, we kind of care about these kids and their struggles, despite them being pretty unlikable. The film feels like a typical horror story at first. The kids are locked in this guy’s spooky house and he is hunting them down while they try and find a way to escape. It’s basic stuff, but it does a lot of things that keep it fresh throughout the run time. For one thing, the guy hunting them is blind. This might seem like a weird premise at first but the execution of it is fantastic. Think of it as Daredevil’s retirement home getting robbed. At first I really felt for the guy, he was old, vulnerable, and these kids were breaking in to rob him of his life savings. This sympathy quickly evaporates when you realize the old man is not so vulnerable. Once he starts killing people it’s hard to harbor any sympathy for him. Watching a blind man hunt down young people is incredibly tense and satisfying as they narrowly avoid him. There are plenty of moments as you would expect where he just seems to teleport to a room and the kid inside has to stand perfectly still. 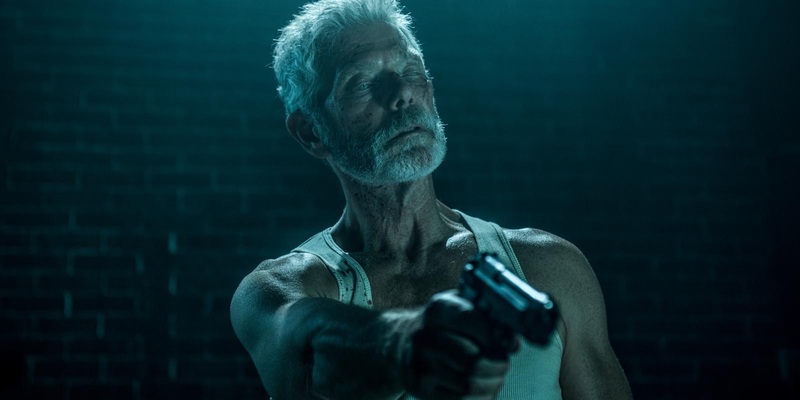 Stephen Lang does an excellent job here appearing menacing yet vulnerable, and a little unstable to boot. There was a moment in the film where the blind man truly becomes the villain of the piece. It was a pretty interesting plot twist that I thought was done well here, but it would have been easy to mess it up in typical horror film fashion. What I liked a lot is that the bad guy had layers to him that developed over time, but it’s the use of space, and location that really impressed me. This movie takes place entirely in one location. There are a few scenes that aren’t at the house to set things up, but the majority of the film takes place in and around the house. It is quite a big house, but it doesn’t feel enormous. It looks like a normal house and has a familiar floor plan. This fact certainly adds to the horror of the film because it’s on familiar ground. The guy does have an enormous basement which is a little weird but I guess not totally unheard of. My favorite scene in the entire film is an excellent sequence in said basement. The blind man turns off the lights and plunges his labyrinthine basement into total darkness. The camera view is replaced with a slick looking night filter, not your typical green one, but a subtle grey that is nicer to look at. The kids that are trapped down there scramble around as they are now sightless like their pursuer. It’s very tense and really plays on the premise of the movie. Watching the difference in the characters movement and actions as they are stripped of sight was really cool. It was definitely a highlight for me. The film has several other great scenes, but I won’t go into them too much here. Suffice to say this is a well shot movie with great ebbs and flows. The tension can be felt throughout the entire ordeal and it never lets go once it starts. The gore is present and feels genuine, but it’s not overstated and it doesn’t take center stage. There is also a dog which adds an extra layer of tension and danger to the blind man and his hunting. The dog can obviously see the invaders and it can chase them into places the blind man cannot. It’s not overly used, but when it is brought into the mix it is to great effect. The way the kids deal with the dog was also good. They didn’t try and kill it, instead they trap it in places by tricking it. This might seem like a small detail but I really appreciated it as it sold the characters as being these young kids who just wanted to rob the guy; they didn’t want to kill his dog. That isn’t them and it made me sympathize with them a little more. Its details like this that really develop characters and it was nice to see. The film isn’t without its problems, however. As I mentioned earlier, the teleportation thing is a little annoying. There’s just a few too many times where the blind man appears in a room seemingly out of nowhere. It does break the illusion that they’re actually in a real house, but it does create the films few jump scares so I understand why they’re there. Another thing I noticed that kind of annoyed me was the red herring deaths. Like the teleport trick, these fake death scenes happen one too many times for my liking. The film starts off really strongly and consistent, but with the cast of characters being quite small, they had to spread them out over the entire film. It ended up resulting in the deaths falling a little flat because I started to second guess them and wonder if they were actually dead or not. There is one really good one which I didn’t see coming, but the rest annoyed me. These faults I have pointed out, although they did annoy me, are pretty minor in the grand scheme of things. They are devices that work within the context of the film and they didn’t ruin my enjoyment too much. Don’t Breathe is an interesting premise executed well, and if you’re a fan of low budget horror films that go for the tension rather than the gore, then this is a film that’s worth your time. It’s fun, entertaining, and kind of refreshing in a market that insists on churning out the same films with different names every Halloween season. There is one plot point and scene that might (actually, no, definitely will) gross people out, but by the time it happens in the film it totally works and doesn’t feel too stupid. If you’re only going to see one scary film this Halloween, you could do a hell of a lot worse than Don’t Breathe.